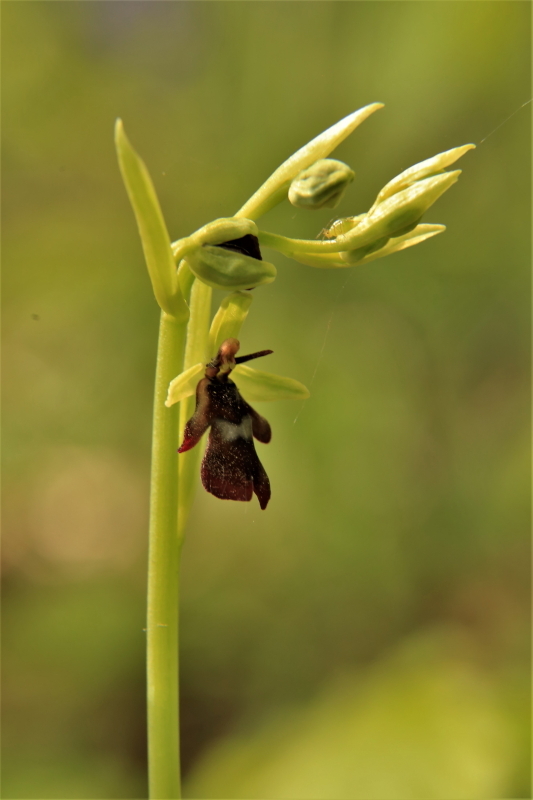 I have only seen one Fly Orchid in my life and here it is. There are several reasons why I have not seen one before, one is that they are quite rare and particularly so in East Anglia, so having spent most of my life in Norfolk it was not something I was likely to bump into. Also you are unlikely to bump into this species as they are quite small and insignificant. Now I live in Gloucestershire and the main locations of these plants are the chalk/limestone regions of England ie the Downs, the Chilterns and the Cotswolds. This particular specimen was growing just inside the the Forest of Dean and not far from the Wye valley, so a little bit out of its normal range. As you can see the flower does resemble an insect and the method of pollination is to attract male digger wasps, which mistake the flower for a female digger wasp. The plant does this in two ways, obviously visually it does resemble a digger wasp, well sort of, but it also produces pheromones similar to those produced by female wasps. The main species of digger wasp that the orchid is trying to seduce is called Argogorytes mystaceus. Is it called mystaceus because it ‘mistakes’ the orchid for a lady wasp??? probably not. 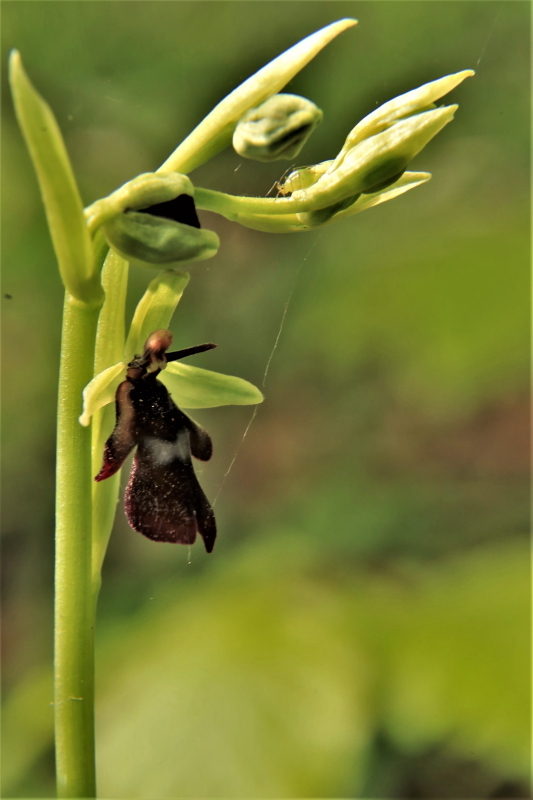 In trying to copulate with the orchid flower, modified stamens called pollinia ( which most orchids have) get detached from the flower and stuck to the wasps head. Not having learnt its lesson and now somewhat more desperate to meet a lady wasp, the frustrated male now finds another flower and the pollinia which contain the pollen get pushed against the stigmatic surface of the flower and thus cross pollination is effected. Clever though this all is, it is not that efficient in this species of Orchid and less than 20% of the flowers produce seed. Perhaps one of the reasons for its rarity. 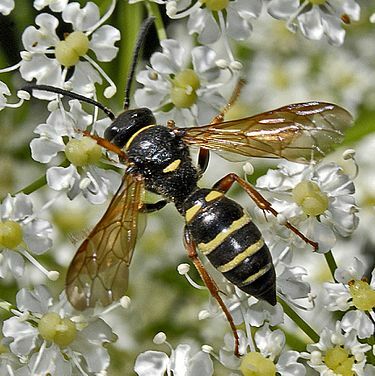 This photo of the digger wasp is from Wikipedia. 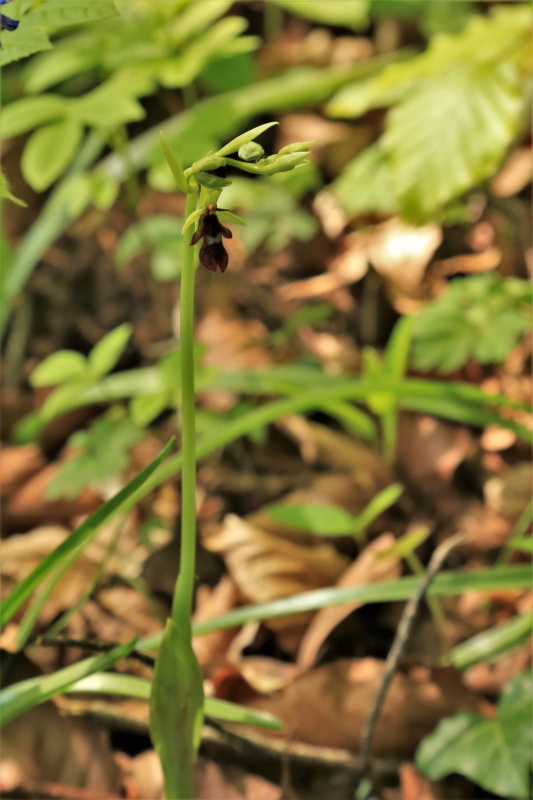 Fly Orchids flower from late April through to early June, they prefer alkaline soils and are usually found in open deciduous woodland, particularly Beech. This one was in exactly that situation and was growing close to some impressive spikes of Early Purple Orchid and Bluebells and Herb Paris, However despite the competition it was the star of the show for me.